Recent years have seen a growing trend to derive models of macroscopic phenomena encountered in the fields of engineering, physics, chemistry, ecology, self-organisation theory and econophysics from various variational or extremum principles. Through the link between the integral extremum of a functional and the local extremum of a function (explicit, for example, in the Pontryagin’s maximum principle variational and extremum principles are mutually related. Thus it makes sense to consider them within a common context. 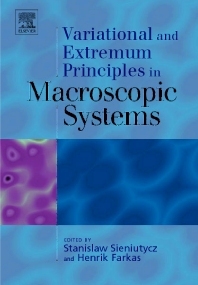 The main goal of Variational and Extremum Principles in Macroscopic Systems is to collect various mathematical formulations and examples of physical reasoning that involve both basic theoretical aspects and applications of variational and extremum approaches to systems of the macroscopic world. The first part of the book is focused on the theory, whereas the second focuses on applications. The unifying variational approach is used to derive the balance or conservation equations, phenomenological equations linking fluxes and forces, equations of change for processes with coupled transfer of energy and substance, and optimal conditions for energy management. Readership is extremely broad and includes applied mathematicians, mathematical physicists, applied physicists, chemists, geologists, ecologists, mechanical engineers, chemical engineers, economists and system theorists, undergraduates, graduates and instructors, both from academia and industry.